My 2014 seed orders have arrived and I’ve interfiled these crisp, unopened packets with the tattered and taped, partially full or nearly empty envelopes of seeds I’m carrying over from past years. It’s a perfect rainy day task, alphabetizing seed packets, moving from arugula to beans, beets, broccoli and Brussels sprouts and on through to tomatoes and zucchini, thinking about what varieties worked well last year, what I’m not likely to plant again and what I’m looking forward to trying this year for the first time. Beans: I rarely grow bush green beans, preferring the flavor and growth habit of pole green beans, but last spring my friend Carol gave me a handful of Maxibel bush beans seeds and persuaded me to try them. They were delicious and productive so I ordered some more from Fedco. Pole filet beans like Fortex are still my favorite but these Maxibels give us a welcome taste of beans earlier in the summer. Eggplant: Last year I tried two “mini eggplant,” Fairy Tale and Hansel from Johnny’s. Fairy Tale was too mini and not very tasty but Hansel was bigger and good enough to try again. I still prefer full-size eggplants like Galine, Diamond or Rosa Bianca sliced into thick rounds and grilled with other summer vegetables or cut into inch-size chunks for caponata but smaller Hansel is handy to have for quick sautés and careful grilling. Kale: Last year’s new White Russian Kale, a relative of Red Russian, was just as tasty raw or braised as its cousin and stood up even better to the deep cold that hit the winter kitchen garden several times this season. It’s also a pretty addition to the kale bed so I’ll be sure to grow more of this Territorial Seed offering this year. Leeks: I tried Bandit and Lexton from Johnny’s this year in hopes of finding a leek that is resistant to leek rust. A few spots of rust did appear on the green spears of these leeks but was no where near so aggressive as rust has been in recent years on varieties like King Sieg or Bleu de Solaize. I’ll try Bandit as well as Lexton again and hope for continued rust resistance. Their flavor is a bit more delicate than that of other leeks I’ve grown but they are just as cold hardy. Mustard: last year, my sister Sarah gave me seeds of Scarlet Frills mustard, a dark red, deeply cut salad leaf with a spicy flavor similar to that of my favorite Large Red Mustard. I planted it in late August and we are still enjoying it in February salads. It’s also great tucked into a sandwich. The winter cold knocked it back a bit but it has rebounded with strong new growth. I’ve ordered my own packet of seeds from Johnny’s. Peppers: last year I tried two new yellow horn-shaped peppers, Superette Sweet Banana and Golden Treasure. Both were OK but this year I was tempted by Gilboa, an orange bell pepper with an “engaging fruity flavor,” and Golden Star, a “sweet and crispy” yellow bell, both from Fedco. I’m looking forward to some taste-offs with my old favorites orange Gourmet and yellow Flavorburst. Radicchios: I like both the round “Chiogiia” type and the tall “Treviso” type radicchios and this year I’m adding a “sugarloaf” type, Pan di Zucchero from Fedco. This member of the chicory family has light-green leaves and looks like a tightly wrapped head of romaine lettuce. I’m anticipating using it both raw and grilled and hoping that it is as tasty as Belgian endive but easier to grow. Radishes: after discovering this year how tasty Red Meat winter radishes are, I’ve ordered seeds of Green Meat and Black Spanish from Fedco for more winter radish treats. Red Meat is more sweet than spicy, Green Meat is likely the same but Black Spanish is billed as very spicy. Squash: I love all sorts of winter squash but I’ve never grown butternut squash. Delicata seemed to fill the slot for a small one or two person squash. This year, though, I’m trying Burpee’s Butterbush, a variety the Fedco catalog says provides “a perfect one-person serving chock full of deep, reddish-orange flesh ‘as sweet as the best sweet potatoes.’” I’ll plant just one hill and see how they turn out. Tomatoes: I had both losers and winners in my tomato experiments last year. The big disappointment was Velvet Red, a cherry tomato that did have pretty, silvery foliage but also fuzzy skin and not much flavor. Ukrainian Purple, a small plum type, was also disappointing because it didn’t have the rich flavor of other dark tomatoes like my favorite Cherokee Purple. Winners more than made up for the losers though. Dester, a pink beefsteak, was productive and close to Brandywine in flavor and Pink Berkeley Tie-Dye was almost as good as Cherokee Purple, close enough to grow again. And for a new tomato this year, I’m going for stripes and trying Pineapple, a favorite of my friend Carol and said by Fedco to be best of the striped genre. Tomatillos and Ground Cherries: This past summer, friends shared so many bowls of wonderful tomatillo salsa that I’m inspired to grow some of these papery-husked green globes myself. I’ve never grown them before and am looking forward to the salsa adventure. From the same Physalis family, I ordered some seeds of Ground Cherries, the fruity berry relative of tomatillos. Last spring during a trip to England, we enjoyed many desserts garnished with a cluster of these sweet fruits. I’m hoping they’ll be a permanent addition to our fruit crops. Both seeds are from Territorial. Now that I’ve merged my new and old seeds alphabetically the next step is reorganize them by planting date. Years ago a friend told me that she organized her seeds by her planting calendar. I tried it and have organized them this way ever since. I have one box for seeds I start indoors and another box for seeds to start outdoors and file the packets by planting week or month. When I’ve planted a crop I either move the seeds to a storage box for next year or move them further along in the calendar boxes for a second or even third planting. Organizing the seeds this way certainly makes it easier to find seed packets on the days I want to plant and reminds me of what else I can plant, but now, on a cold and rainy February day, it also lets me indulge in daydreams of the garden year ahead. 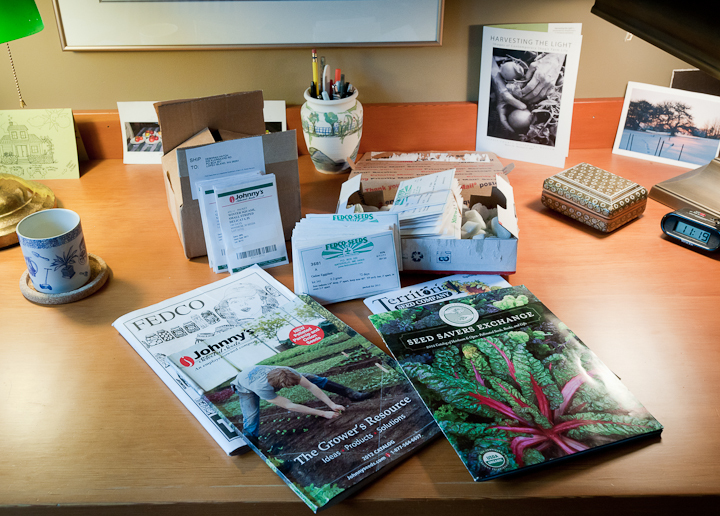 This year’s seed orders have arrived, compact cardboard boxes from Johnny’s and Fedco holding white paper seed packets printed with the company logo, vegetable variety, germination data and planting and harvesting advice. Neither company goes in for color photos or line drawings on their seed packets—their catalogs provide the visuals—so the names are what I rely on to conjure the potential of the seeds inside. Some names are new to me, varieties I’m trying this year for the first time. Others are familiar from last year, ordered again because they were great. And finally there are old favorites I reorder every few years. 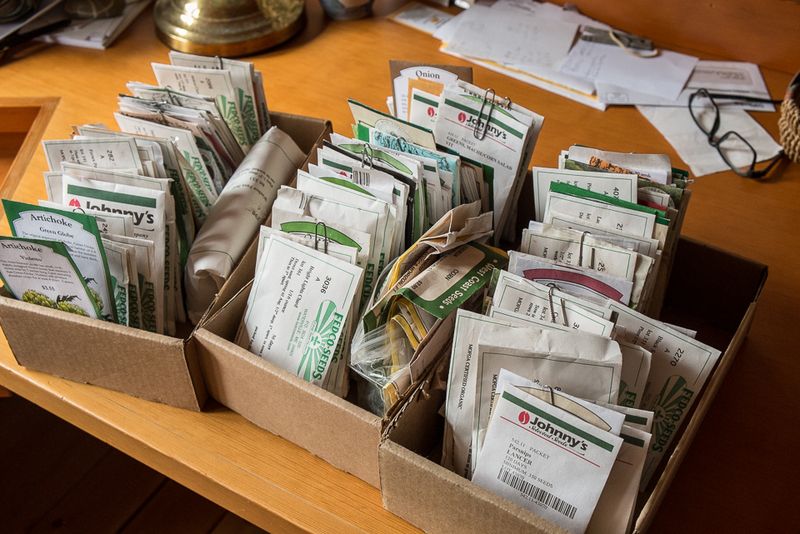 In the quiet of my study, as I organize seed packets by planting date, it’s lovely to imagine the garden time and the meals that lie ahead. In less than a month I’ll be planting Red Round turnip, a colorful new companion to white Oasis that I’ve planted for the past few years and loved. And I’m adding new radishes—multi-colored Easter Egg, red and white French Breakfast and green-outside-red-inside Red Meat, aka Watermelon Radish—to my standard Cherry Bells. Radishes tasted really good last year and I’m looking forward to eating more this year. I’m planting kohlrabi for the first time in years, Kolibri and Early White Vienna, just a short row it see how it tastes. Indoors over the next few months I’ll start some new varieties of tomato, eggplant, winter squash and pumpkin. In my ongoing search for the perfect cherry tomato, I’m trying Gardener’s Delight, parent of Sweet 100, an old favorite. And in the search for a wonderful paste tomato, I’m trying Vilms, reputed to have excellent flavor and roasting potential. For a new eggplant, I ordered Galine, an early, purple bell-shaped variety to join favorites Diamond and Rosa Bianca. Eastern Rise and Nutty Delica are two new winter squash varieties to plant with my favorites Buttercup, Sibley and Delicata. And for something completely new, I’m trying Kakai pumpkin for its hull-less seeds and the promise of roasted pepitas. For the winter garden, I’m trying a Canadian rutabaga variety, Laurentian, and a wild arugula, Sylvetta. Among last year’s new varieties that I’m repeating this year are Lancer and Javelin parsnips, winners for quick and even germination and rich sweetness. Another new variety I tried last year and will plant again is Nautic Brussels Sprouts, cold hardy and delicious. And Rattlesnake pole bean and Drabo dry bush bean were tasty additions to last year’s beans and two to plant again. Finally, old favorites that I reordered this year are the original Sugarsnap snap pea for its perfect pea flavor; Mokum carrots, crisp and sweet at all sizes; Purplette onion for spring onion roasting and Copra and Redwing onions for winter storage; King Sieg and Bleu de Solaize leeks for their winter hardiness; Gourmet pepper for a sweet and spicy orange bell; Brandywine tomato for classic tomato flavor; and Indigo radicchio, pleasantly bitter grilled or sliced raw. For all my other favorite vegetables, I have enough seeds left from past year’s orders or seeds I’ve saved, so I’m set for now. Then again, it’s still early in the seed-buying season and there are more catalogs, websites, and friends’ recommendations to tempt me.